All that time traveling the south allowed them to dig deeper into the complexities of Americana adding rockabilly, boogie, swing, gospel, and bluegrass to their list of musical influences. After a performance in their old stomping grounds at a cigar box guitar festival in New Jersey, April and Catfish found the distinctive sound they were looking for. Adding an upright bass player to the mix, April Mae & the June Bugs were formed in 2010, delighting crowds with their eclectic, spunky, roots music performances. April’s amazing vocal talents combined with Dave’s killer guitar chops and on-stage antics make for one heck of a show. Traveling in an unmistakable red and cream colored, biodiesel-powered vintage school bus, April and the crew continue to tour, rocking clubs and being featured at festivals and events throughout the south. 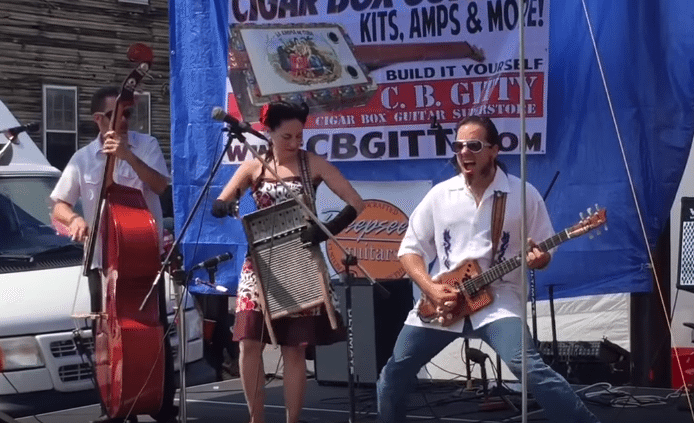 They have made regular appearances at several prominent Cigar Box Guitar festivals, including the two largest in Huntsville, Alabama and York, Pennsylvania.